Week before last, my older son came home for Spring Break, coughing his lungs out. By the time, the week came to a close, he was down with a raging fever, bronchitis and asthma. He returned to college last week, still coughing and feverish. Only, he left a loving gift behind. By Thursday night, my throat was itching, By Friday morning, I was beginning to cough. By the time the weekend rolled in, I was running a temperature. Today, my husband helpfully told me that I looked like I had been hit by two trains. I thanked him for his concern, my voice something a frog would love to emulate. But in the interim period, I watched many movies - Ek Saal again, thanks to Bollyviewer (not! ), and a surfeit of Katherine Hepburn - Adam's Rib (what did people see in this film? ), Woman of the Year (a more regressive film I haven't watched in ages! ), The Philadelphia Story (I didn't know James Stewart could be so amusing!) and this one here, Holiday. 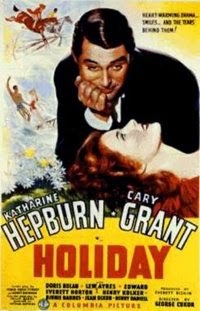 Holiday is one of the earliest Cary Grant - Katherine Hepburn romances. In fact, Hepburn recommended Grant for the role. It is not a new or a 'different' story. At its heart it is a just a story of a young man who, having fallen in love with a girl, has to make decisions about the course of his life, and his place in hers. Johnny Case (Cary Grant) runs into Julia Seton while on holiday at Lake Placid. Ten days and a whirlwind romance later, he's asked her to marry him, she's accepted, and now, he is on his way to meet his fiancée's family, and to ask her father for her hand in marriage. All this we know from Johnny's confession to two of his oldest friends - Professor Nick Potter (Edward Horton) and Susan Eliot Potter (Jean Dixon), with whom he's come to stay. They are delighted to see him, of course, but not quite as delighted when he decides to whip out of the house again after dropping this bit of news on them. Especially when they realise that all he knows about the love of his life is that she has dimples, and he didn't think they made them like that any more. The truth is that he doesn't know anything about her family either - except that she has a sister, a brother and a father. So little, in fact, that when he finally reaches her 'house', it gives him pause. But it's only for a moment, since he assumes that his Julia works there. And so Johnny happily hurries around to the servant's entrance. Where he's met by a butler who is aghast that Miss Julia Seton's guests have not entered the house through the front entrance. By the time Johnny is led through what seems like miles of corridors and through vast marble-tiled rooms, and taken an elevator to the living room, he is feeling very small and deflated indeed. But being Johnny, that doesn't last long. Julia (Doris Nolan) is quite happy to see Johnny again (though not quite as happy with his rumpled hair and his crooked tie). Johnny is still trying to wrap his head around the fact that Julia, his Julia is rich-and-all. When she admits that she is, he tells her that he is thrilled about it. It's exactly how he would feel if she had told him she knew how to play the piano, he tells her. Julia is taken aback. But Johnny is serious - playing the piano and being wealthy are both very pleasant accomplishments for a girl. Julia is serious too - Johnny is going to make millions as well. (Uh, no, says Johnny.) Julia brushes off his protestations by telling Johnny to drop her off at church and come back to the house exactly at 1 p.m. She is going to break the news of the wedding to her father while they are at church. Because when they are in church, her father cannot talk. But before that, they run into Linda (Katherine Hepburn), Julia's elder sister. It is obvious that she is quite different from her sister. She and Johnny have a fine time talking about the ghosts in the house, the skeletons in the Seton family closet, and the black sheep of the family, much to Julia's disapproval. Linda thoroughly approves of Johnny, however. Edward Seton (Henry Kolker) is not too pleased at the news that his favourite daughter is going to marry a penniless nobody, but as Julia had predicted, he's forced to keep quiet. Meanwhile, Johnny, having perambulated around the block has arrived back at the house, too early for his luncheon appointment. He is quite ready to leave when the butler tells him that Linda is expecting him in the playroom. Johnny gets another surprise - the playroom is nothing like the rest of the house. Johnny is finding Linda very different from what he expected; she's full of fun and whimsy. He's also learning quite a bit about his wife-to-be's family. As Linda says, it's terribly important that Julia marry the right man. And Johnny is rather a strange bird in these parts. Linda is also learning about the new man in her sister's life. Johnny confesses to her that his holiday in Lake Placid is the first holiday he's ever had in his life. He's been working since he was ten, and once he's saved enough money, he's going to take a holiday to find out what it is he's been working for all this long while. That makes a lot of sense to Linda, and she is impressed. He hasn't been caught by it, she tells him, the reverence for riches, but - does Julia know? Julia obviously doesn't. But when she returns from church, she is definitely bothered that Johnny doesn't look his best. Both Linda and her brother, Ned (Lew Ayres), take it upon themselves to 'coach' him in preparation for the big interrogation. How is he fixed for money? Any gilt-edged securities? And what about socially? Who were his parents? He must know some prominent people? No? Johnny gets right into the spirit of their 'inquisition' (even promising to show Linda his back-flip) but Julia is definitely on tenterhooks. Linda is happy for her sister. "Life just walked into this house this morning," she tells Julia, as she makes her sister promise that if their father agrees to the engagement, Julia will let her, Linda, throw her an engagement party in the playroom - a small one, with just Julia's friends and Johnny's, and no engraved invitations. Their father is not quite as sanguine. What is the young man's background? he asks; what are his prospects? It would be advisable, he tells his family, if the young man met him alone. Linda offers to hide under the sofa to take shorthand notes. The levity is obviously not her father's cup of tea, and he finds it hard to mask his displeasure when his eldest daughter doesn't take the strong hints he gives her to leave the room. Eventually, though, he has to bow down to the twin pressure of his younger daughter's exhortations and Johnny's never-take-no-for-an-answer cheeriness. Linda is ecstatic, until she learns about her father's (and Julia's) plans for the party. New Year's Eve rolls along, and Johnny is at Seton House, dressed up all proper and prim. He is taken aback when he realises that Linda is not attending the party, especially when Ned explains why. No less flustered are the Potters who have only come to lend Johnny their moral support. Totally out of their depth, the Potters lose their way and find themselves in Linda's playroom. Before long, the Potters and Linda have found themselves kindred souls as well, and are having a lovely time by themselves. Then Ned walks in, followed by Johnny who's been sent by Julia to talk Linda into coming to the party downstairs. But the latter hadn't bargained for what he would find in the playroom. Neither, for that matter, had Julia and Edward Seton who walk in a little while later in search of Linda, and everyone who's been sent to bring her downstairs. What follows is not exactly what Johnny had planned on. Everything he's hoped for, dreamed of, seems to unravel in many different directions. "There's a conspiracy against you and me, child," he tells Linda. But he's unsure now, of himself, of Julia, of his future, of his dreams, and as the New Year rolls in, Edward Seton announces the engagement of his daughter Julia with the young and upcoming finance whiz, John Case. Johnny smiles gracefully, accepts the congratulations of the gathered crowd, walks down the staircase, out of the house, and seemingly out of Julia's life. What does the future hold? For Johnny? For Julia? For Linda? Cary Grant and Katherine Hepburn acted in four movies together - Sylvia Scarlett (1935), Holiday and Bringing Up Baby (both 1938), and The Philadelphia Story (1940). While their initial outing wouldn't exactly set the box-office on fire - 'Grant was the only reason to see Sylvia Scarlett. It was a terrible picture, but he was wonderful in it,' said the film's heroine, who would be termed box-office poison after its failure. That was the beginning of a beautiful friendship between the two stars which would last their lifetime. Holiday is not as well-known as Bringing Up Baby that came out the same year, but in my opinion, it is more delightful than its more popular rival. Grant was not as suave as he would come to be in later films, but here, he has a open-hearted boyish exuberance that makes one fall in love with him. (I've also discovered that Cary Grant with rumpled hair is even more dishy than Cary Grant with his hair all slicked back.) His Johnny is not a lay-about; he has a good job, and is sharp enough to turn a deal that makes him quite a bit of money, and make his boss say good things about him. But he's still sorting himself out, and is ready, once he's stashed away a bit of savings, to take the risk that will allow him to find his place in what he calls a rapidly changing world. Hepburn was no less. If you have ever belonged to a world you didn't quite fit into, felt just a little out of place, a little misunderstood, a little overlooked... you will understand Linda Seton. Yet, there is no pathos here. Linda is on the outside looking in, and with the objectivity that distance lends her, loves her father and sister even though she has nothing in common with either. Hepburn plays the free-spirited Linda with grace and charm, a little bubble of laughter never too far away from her lips. Linda's brother, Ned, an aspiring musician, has her sensitivity but not her backbone to withstand their father's brandishments. It is an small but endearing performance by Lew Ayres. The strong vein of humour that keeps Linda from being flattened by the weight to be someone she is not, finds its counterpart in the twinkle in Johnny's eyes and the hint of mischief in him that refuses to be subdued. Bereft of any companionship, she welcomes Johnny as a kindred soul, and is soon drawn to him, only to be conflicted about the happiness of the sister whom she loves, and who, she is sure, loves Case. The film truly belonged to its leads, who ate up the script and made it their own, but I cannot but mention Edward Everett Horton (who reprised his role from the 1930 original) and Jean Dixon who play Case's friends, the charming and rather eccentric Potters. In the original film, the Potters are wealthy socialites. In this version, they revised the script to make them more down-to-earth and 'common man' types. But between the two of them, they have some of the best lines of dialogue in the film. Holiday's main attraction was the script, that had much more depth than did The Philadelphia Story even. 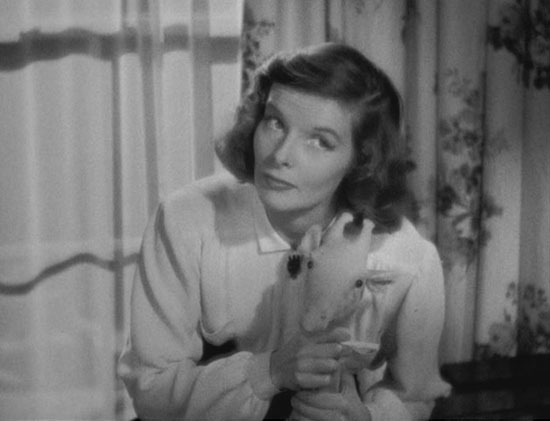 Based on a play by Philip Barry (who was also the source material of The Philadelphia Story), Hepburn had actually understudied the role of Linda Seton on Broadway, and had used a scene from the play for her screen test - it would prompt George Cukor, soon to be a good friend of hers, to offer her her first screen role in A Bill of Divorcement. George Cukor also directed this sweet romantic drama with its liberal dashes of humour while at the same time playing up the social politics of the script. Cary Grant's down-to-earth persona matched that of Johnny Case, a down-to-earth self-made man who wants to earn only as much money as will allow him to spend his best years holidaying. The script also made great use of Grant's acrobatic skills, and Hepburn matches him step for step, leading to some delightful scenes for our edification. Unfortunately, though the film was well-received by the critics who praised both Hepburn and Grant for their bravura performances, Depression-era audiences were not too enthused by Grant's character who wanted to throw away a perfectly good job with its opportunity for advancement so he could spend his life doing what he wanted to do. Johnny's happy-go-lucky ways did not find favour with men who were struggling to find employment. But if you have watched and loved The Philadelphia Story, you will love this one as well. In fact, you may even like it more than the former; I know I did. If you haven't watched either, there's a double treat in store for you. I haven't watched The Philadelphia Story. And, I must admit, Katherine Hepburn isn't one of my favourite actresses. I've never been able to quite figure out why - I mean, I agree she was good as an actress, but I'm not too fond of her. Against that, there's the fact that I'll watch anything for Cary Grant. (And a rumple-haired Grant? Ooooh!) :-D Plus, your review makes me want to watch this. You're getting back at me for writing about Ugetsu, aren't you, Anu? Adding to my list of films to watch. Bad girl. Oh, Grant's fabulous in this, Dustedoff. I'm discovering just how much I adore that man - and here he's so, so, well, he reminded me of a puppy, so full of life, and so eager to please... I must admit to never having liked Katherine Hepburn in her Spencer Tracy films (and the recent viewing of Adam's Rib and Woman of the Year did nothing to change my mind (but then I can't stand Tracy! ), but oh, just watch her in this one! She's wonderful! Grinning at getting back to you - must confess that I assumed you had already watched this and The Philadelphia Story. Watch out. That's the next review. And that has the added attration of James Stewart as well - in a role that is so unlike Jimmy. I would suggest you put both on your to-watch pile - on top! I've been meaning to see this for ages. I DO love Philadelphia Story so much that my DVD is starting to look like it's been through a war. But for whatever reason, I've never gotten around to this film. Also, I didn't know that Hepburn recommended him! I know she was supposed to have had a kind of a comeback with Philadelphia Story . . . maybe because good films like this just weren't sensitive enough to the times. Frankly, if you ask me, I think Holiday is far superior to The Philadelphia Story. Though I liked both. This was far less black and white, actually. This, I think, is one of Hepburn's best films, and certainly, the best of the pick of her films with Grant. I don't know why this isn't better known. Do watch if you can get your hands on it. This is probably my grandmother's favourite film, I don't know how many times I have watched this film with her :) she actually taught me Urdu by writing out various film dialogues and have me translate it into multiple languages from the Urdu lol Ahhh memories. However, I'm not a huge if the film itself (blasphemous I know!) even though I've got the entire thing committed to memory by now. To be honest, I find it to be too long and slow paced aka BOOORING, but I watched it every Saturday afternoon with my dadiji. I think I like the memories attached to the film more than the film itself. I ran there must be a reason why I own 3 copies of it. It's my way keeping dadiji with me always. Anyways thanks for the trip down memory lane! Oooh Cary Grant!, I would see any film featuring him, I just love the way he acts, he has this boyish charm, he was quite old when he did 'Charade' with Audrey hepburn, but even then he had not lost his charm. Would have loved to see this film. I have watched only three movies of Cary Grant earlier, all Hitchcock movies. Once again your good review made me watch the movie. I enjoyed Cary Grant’s role in this film. But I liked Katherine Hepburn more than anyone else. She was the live wire of this film. But it was already there, but never kindled before, it required the right chemistry to ignite the bubbling, but somewhat subdued energy. The role of the Potters and Ned too was good. I have not watched The Philadelphia Story. I intend to watch it later. Oooooh Cary Grant is right! :) You should watch it, Shilpi. It is such fun! Grinning at this anecdote, Thundercat! If I had to watch any film every weekend, I think I would be bored with it. :) But what a nice way to remember your dadiji. And oh, to learn Urdu! I was just emailing a friend about having wanted to learn Urdu for the longest of time. Y'know, when I first moved to the US, there used to be an online 'Learn Urdu' site. Then, I didn't have the time. Now I do, and I want to learn, and when I search for online sources, all I get is the very Arabic Urdu - I hate it! I want the original version, our Urdu, not this bowdlerised version which says Allah Hafiz instead of Khuda Hafiz (for example). :( I've to look around for someone in this part of the world to teach me. You know that I think about it, you're right. I remember in university meeting a fellow Urdu speaker and I remember thinking the same thing. I wonder why that is. I would have gladly helped you learn Urdu think we live too far apart and I'm far too busy with work and MBA stuff for me to do that we'll. Lol. I'm sure you'll find something though, especially with the seemingly endless resources of the Internet. I have also watched old movies at BRV! There was another place also which showed old movies regularly, but I have forgotten its name. It was on my way to work, so it was somewhere between Museum Road and Vani Vilas Hospital. I think it was on J C Road. Any idea if it is still there, and what is its name? I don't know if it was Poornima, but I watched Azaad one week and Pyaasa the next week in that place! Yes, I used to watch lots of old (and new) movies in those days. My place of choice was BR - I have watched so many old films there. :) Poornima was quite far away from where we lived, so I think one or two films were the maximum that I watched there. This is a great post, and I kind of think deserves a sequel. When I first started browsing older Hindi film blogs, I ran across this post, and it definitely led me to a few films that I might not have gotten around to (Dastak and Awaara) since I loved the songs you selected. Dastak, especially I watched about six months ago purely based on the song and your commentary. A good sensuous song can even make an actor you don't especially care for attractive. Even tho I'm not on the Dev Anand train, I loved Yeh raat yeh chandni, it's just so haunting. In fact, I wonder if "haunting" is something that a good sensuous song has to be? It has to stick under your pores and linger, if not in actual tune, then at least in mood. Like you said, it is a representation of what is to come . . . it's about longing, not satisfaction. I find that you have nor posted any new write-ups or reviews since April end. Or am I missing out something. Perhaps I should do a list of haystack songs. :) Both your songs would fit. I can't believe that I missed Beimaan tore nainwa - it is wonderful and yes, very, very sensuous. Their chemistry was unbelievable. Thank you for the appreciation. And I apologise for the delay in replying. Hmm... interesting, but I'm sort of caught in a quandry - how do I expand on this list without making it 'Sensuous Songs - Part II'? Have to think about it. I'm glad that my post got you to watch a couple of really good films. :) Especially Dastak, which is not quite as well-known. Yes, a good sensuous song has to linger in your consciousness - definitely 'in the mood' as you so eloquently put it. Thanks for the comment. It encapsulated what I was trying to say in this post. Thank you for asking, Mr Venkatraman. It's been a very busy two months with work, plus I've not been keeping too well. It's been hard to whip up the enthusiasm to write, actually. Hopefully, I'll get back to blogging soon. Well , I understand. Hope your ailment is minor, nothing serious. Wishing you a speedy recovery and everything best to you and your family. We were watching Mughal-e-azam a couple of days back, and I wondered if "Jab raat hai aisi matwali ..." was in your blog post for Raat, so I came here and found that you wanted the song to start with the word Raat, so of course, the song wasn't there. Then I came here and re-read the post. We haven't finished watching the whole movie, stopped just before the song, Ae mohabbat zindabad ..., and argued about why Akbar should be considered a great king, when he was ready to kill his own son, and a young girl, just because they happened to be in love! Well, J did the arguing, I hemmed and hawed and finally told him he should go and talk to Akbar and the rest of the Mughal kings about it, and leave me to watch the movie in peace! Imagine ruining a great movie like this with such a discussion! I have the black and white DVD, but J wanted to watch it in color, even though I told him it was better in B & W. Loved the trivia about the songs, Bade Ghulam Ali Khan, loved the songs and Madhubala, loved everything! And all this while J was wondering if I remembered seeing the place where Tansen did his singing when we visited the Agra Fort, and did it look like it did in the movie! I was laughing midway through your comment, Lalitha. :) I can just see S come up with much the same comments. I agree with you that the black and white version is any day superior to the colourised version. And I was so happy to see the black and white version of it available on DVD when I went to India this time that I bought that as well. So now I have two copies of the film. I haven't watched it again yet, but I also hope that this version has the full movie instead of cutting songs and scenes as and when they feel like it!